Bobby Grant is now determined to have his first taste of success after becoming Fleetwood Town’s longest-serving player. He joined Town in the summer of 2015, a year after promotion from League Two and, after a four-year trophy drought, the Cod Army are now eager for success. Grant was part of the side that nearly reached the Championship for the first time under Uwe Rosler in the 2017/17 season. 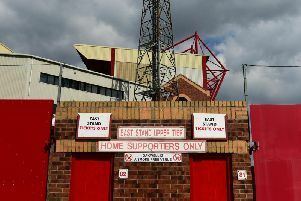 They missed out in the play-offs but, under new boss Joey Barton, there is a renewed optimism at Town and Grant is eager for his time at Highbury to include medals. When asked if he wanted to add promotion to his Town CV he said: “Definitely. I’d be lying if I said it has not crossed my mind. “At the start of this season it is in my mind. “Those are my aims personally, and if we can do that, I’d be over the moon. “It comes down to taking it game by game. “When it comes to talking about that I am sure we will. It is Barton’s first managerial role, one which started with a league defeat to AFC Wimbledon last Saturday ahead of Saturday’s trip to Oxford United. With Rangers loanee Jason Holt back from suspension and Dean Marney pushing for a start, Grant is battling it out to retain his spot in the starting line-up. He said: “Personally it has been great. “A fresh start, fresh ideas, new staff, new coaches and a real buzz around the place which is very important. “Also, everyone has got a fair crack of the whip and everyone has got a chance to impress. “It is all about winning; we win together, we lose together and it is all about winning. Grant also explained what has changed at Highbury since Barton took over in the summer. He said: “The one thing that comes to my mind is the standards that the gaffer and all the staff he has brought in and the standards that he sets are all high. “The minute you fall below them you will know about it. “We are preparing for each game as it comes.